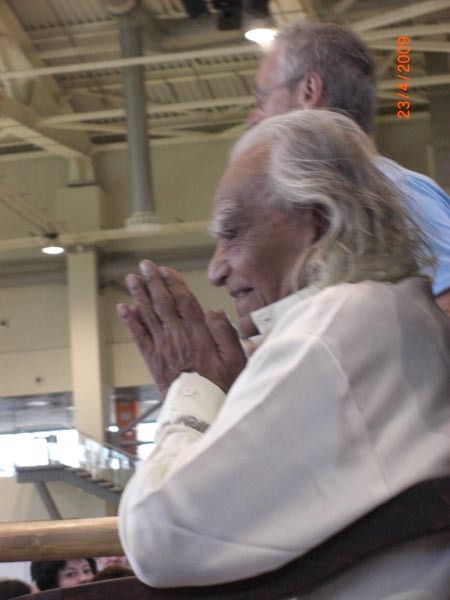 The news of Mr. Iyengar going to Moscow took most of us by surprise; it all happened very quickly and not many people knew about his visit to Russia. To make things more difficult the initial information was published in Cyrillic script. Guruji was invited personally by Derk Sauer, the publisher of Yoga Journal magazine in Russia. According to Khatuna Kotiashvili from Yoga Journal Russia, whom we met during the convention, Guruji agreed to go to Moscow 2 months before, but even they were not sure that it was going to be possible to arrange such a major event in such a short time. Together with a colleague and friend Jose Barrientos, I was one of the few lucky people to hear about Guruji’s visit to Moscow 2 weeks before the event. We knew straight away that we wanted to go, so we started the frustrating and expensive negotiations to get the required visa to Russia, an essential letter of invitation from the tourist board and finally the ticket. Despite these frustrations it proved to be well worth it. Russia has 30 to 40 yoga studios; most of them in Moscow with thousands of yoga students, the majority of them practise Iyengar Yoga. To bring Guruji to Moscow the organizing team tried to charter a private plane but this attempt fell through so they got scheduled first class tickets instead for Guruji and his 14 assistants. Jose and I arrived to Moscow the night before the convention was due to start to very mild weather; Guruji had arrived 2 days earlier to find that it was snowing. During the 2 days before the convention, Guruji gave press and television interviews where he talked about the therapeutic benefits of yoga. He was also due to meet with the President, Dmitry Medvedev “an ardent yoga practitioner”. I now know that this was not possible but he did meet the president’s wife who said that all Russians should practise yoga every day. Initially the convention was due to take place in a smaller venue but the response of his Russian students and the few from other countries required the organisers to find a bigger place to accommodate 650 participants. The VVTs, known as the All-Russia Exhibition Centre, a former Stalinist “theme park” that once extolled the achievements of the Soviet economy, decorated with mosaic-encrusted fountains, iconic monuments and many pavilions was chosen to house the convention. The Russians attention to detail despite the short preparation time available was such, that they had even thought to arrange for a bus to pick people up from the main entrance of the VVTs to the pavilion 5 minutes away on foot. However, the system for placing our yoga mats was left to the kindness of us yoga pupils, which proved disasterous as we all wanted to be close to him. The first day, Thursday 23rd, the convention was due to start at 9:30 am. Jose and I left our rented apartment at 7:30 to give us plenty of time to find our way by Metro, luckily three stops away from the venue but nevertheless time consuming, as all the signs are in Cyrillic script. When we got to the venue we found it full. Most people got there at 8 to wait for the door to open at 8:30 and then stampeded to get a place close to the front. Two stages were requested by Guruji, one of them in the centre to make sure that everyone managed to see the demonstrations. Guruji travelled with his grand daughter Abhijata Shridar; Indian students, Devki Desei, Arti Mehta, Zubin, Amit Pawar, Raya and others as well as some of his senior teachers: Faeq Biria (France), Manouso Manos (US), Patxi Lizardi (Spain) and Clé Souren (the Netherlands). At 9:30 Guruji came into the room to be greeted by a delighted and expectant crowd. Guruji reminded all of us that this was his second visit to Russia; the first was in 1989 when the health minister of the Soviet Union had invited him to give some lectures and yoga demonstrations. Apparently in those days of the Communist regime it was not permitted for people to practise yoga at all and the few people that were practising were doing it with the help of an illegal photocopy of “Light on Yoga”. He remembered addressing 300 people during his first visit; today we were more like 650. Gurujis teaching was enthusiastic, deep, humorous and sometimes fierce. The Asana practice from 9:30 to 1pm every day was taught by him, his instructions interspersed with constant Russian translation. He spoke about the importance to maintain the balance of mûla- Prakrti in our asana practice, showing in Abhi’s demonstration of Utthita Trikonasana how earth (prthvi) is present in the feet and the legs, water (âp) on the top side of the trunk, air (vâyu) on the top arm and hand, and fire (tej) in the solar plexus. He then added that to master an asana it may take a life time, but if we don’t do it in this life we may do it in the next one. Asana, he said has to be practised with the body for the soul. Asana has to be full of green lights not red lights. If I understood correctly he was referring to the obstacles that we encounter in our yoga practice. In Tadasana he emphasised the rotation of the top of the thighs, all the standing poses need to be done with legs wider to feel the inner groins in Utthita Trikonasana we should use maturity and intelligence like a seed that has to open, it may take years but like a seed it has the potential to sprout. To stabilise in Utthita Trikonasana, the root of the nail of the middle finger (vâyu) has to remain firm, the skin from the wrist to the shoulder socket has to extend down but the flesh has to extend up. Ardha Chandrasana was demonstrated and taught many times lifting the leg from the inner groin; in Parsvottanasana again the inner groins were the centre of the teaching, the inner groin of both legs have to go back, the same in Prasaritta Padottanasana, he even said that if we do this asana correctly we will know the meaning of grace. In Parsvottanasana the back of the hands were on the floor, the Parivrttas were demonstrated between 2 trestlers for direct perception. Adjustments that we make in our bodies have to move from gross adjustments to subtle ones to create and find freedom. In Bharadvajasana 1, the somatic ego (the outer hip) has to remain stable to turn away from it, feet, buttocks and inner groins down, rotate the fingers on the floor to turn. In Paschimottanasana, Gurujii told us that the legs were the legs of Chaturanga Dandasana; the shins as in Urdhva Mukha Svanasana; the outer hips and thighs have to work as in Adho Mukha Svanasana to be able to extend further. Mind blowing information, instructions and demonstration were generously given during all the asana sessions, so many that my mind, weeks later is trying to process all the information. Without showing signs of fatigue after teaching the asana class of the morning, Guruji then spent 15 to 20 minutes every day of the convention signing books. In the afternoon, 2 hours Pranayama was taught on the first day by Gurujii and the others either by Manouso, Patxi or Faeq. On one of the afternoons the film “Leap of Faith”, was shown with subtitles in Russian. For us, there were very intense 4 days as after the classes we visited the tourist sites, travelling in the showcase Metro with hundreds of stairs: from Red Square we saw St. Basil’s Cathedral, Lenin’s Mausoleum, the Kremlin walls and the GUM department store nearby. One night, with the help of one of the Russian students we were very fortunate to get tickets to the ballet at the Bolshoi Theatre to see Spartacus, arriving exhausted to our rented apartment for a well deserved rest…… until the next day. Sadly our return to London was on the afternoon of the last day of the convention so we missed the closing ceremony, which I heard was very emotional. Having reached 90 years of age Gurujii still continues giving and giving in an unselfish way. May he pass this generosity to all of us to share with others what he gives us. In praise of the Russians, Guruji said: Russians are unique; they have an occidental head and an oriental heart. This makes them very interesting. They are also very intellectually and philosophically sound”. I would like to thank Jose Barrientos, for his company and comments for the article, to Guruji for his teachings and to Richard Agar Ward for reading and correcting the article.